Aozora Jumping Heart (青空Jumping Heart lit. 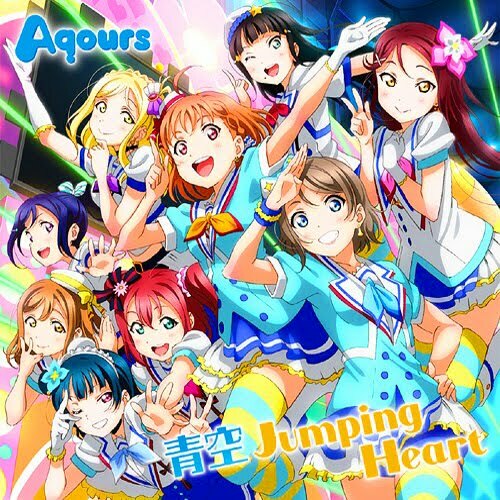 Blue Sky Jumping Heart) is Aqours' third single as well as the Love Live! Sunshine!! Season 1 anime's opening song, starting from Season 1 Episode 1 onwards. It was released on July 20, 2016. The song is written by Hata Aki, composed by Itou Ken and Mitsumasu Hajime, arranged by EFFY. (Let's go!) zenbu aketai yo hora, issho ni ne! Sore dake de ashita e to susumeru seishun masshigura!? (Let's go!) hikari no mukou e hora, issho ni ne! Chikara ippai kanaeyou negai o seishun pikkari da!? Gooru wa doko? Doko darou? Wakaranai! Minna to nara setsumei wa dekinai kedo daijoubu sa... masshigura! Let's chase the orbit of unseen dreams! Let's look for them together! From our start line, I wonder if the goal is far away. Let’s use all our strength to grant our desires Isn’t youth surprising!? so let's go and catch our dreams! Let's look forward happily and see what happens! If it’s with everyone, it’s fine even if I can’t explain it… so let’s go straight ahead!